It’s been an unseasonably cool summer in Southern California. But, at long last, a sort of heat wave has finally arrived. As the temperatures rise, the number of ice cream trucks seem to multiply. This was the case when I was growing up and remains true in 2010. Sadly, the selection of frozen treats sold to today’s youth isn’t much healthier than those that populate my memories. Artificial colors, flavors and high fructose corn syrup are still mainstays of many of the best selling popsicles. You can view this as a rather disheartening example of how some things never change or you can do something about it. 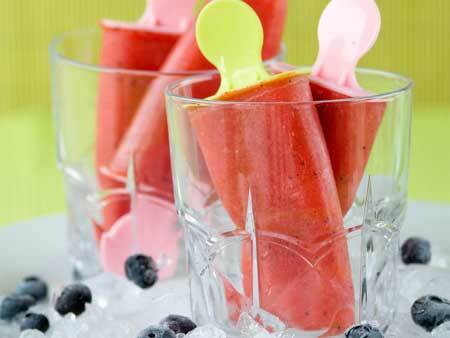 Why not make your own popsicles at home? Building a better popsicle is as simple as using more natural ingredients and a little ingenuity. The process entails identifying what you want to eliminate and establishing the nutritional profile you’d like to achieve. For today’s recipe I had a few objectives: 1) get rid of all of the artificial ingredients; 2) create vibrant colors and flavors; 3) drastically reduce the sugar content; 4) incorporate ingredients that may yield health benefits. Some of you may be feeling a little bit uncomfortable with the notion of deliberately adding saturated fat to a recipe. After all, coconut oil is compromised of over 90% saturated fatty acids. But please don’t panic. Instead, I would urge you to consider several recent publications before assuming the worst of this traditional fat source. Nutritional Content: Calories: 135. Protein: 1 gram. Fat: 12 grams. “Net” Carbohydrates: 5 grams. Fiber: 1 gram. Makes 6 popsicles. Heat 4 oz of purified water and steep the 6 tea bags for at least 15 minutes. Allow to cool and then press the tea bags to extract every last drop of flavor. Place the frozen berries in a pitcher. Add the organic coconut milk and the brewed tea concentrate, as well as the liquid stevia and a sprinkle of salt. Use an immersion blender to process until completely smooth. Fill six popsicle molds leaving about 1/4 ” on top to allow for the natural expansion that occurs during the freezing process. Freeze for about 4 hours before serving. Those look good! We will try them soon! Thank you, Nancy. I hope you’ll enjoy them as much as we do. Thank you, Josh. I love coconut in general. In fact, I just enjoyed one of these popsicles earlier this afternoon. They seem to boost my energy level. Perhaps it’s due to the MCT content? These tasted very good on my first attempt and my kids loved them! Even my husband enjoyed his tropical berry Popsicle.